Love this blanket , ordered king size and it is true to size ! Wrap yourself in comfort with this durable high performing microplush, luxuriously soft and light-weight anti-pilling blanket. This blanket is very soft and comfortable. I have washed it twice already and it still looks brand new. This is very good quality for the price and the pattern and colors are nice. I would recommend this to a friend but I do have to say that the sizing is a bit small. I ordered the king size and it is not wide enough to be tucked in under the mattress' width. The length is good but the width is a bit short. I still use it as a king size blanket under my comforter and it works fine but if your spouse tugs on blankets, then I would recommend getting something else for that use. As a throw blanket it is awesome. I liked the size, color and softness of this blanket, but then I washed it! I agree with the other reviewers - this blanket sheds little fuzzies that stick to everything else. I've tried re-washing and re-drying a few times, but the blanket is still shedding all over. Its unusable unless you never plan to wash it. This blanket is super soft and cozy! 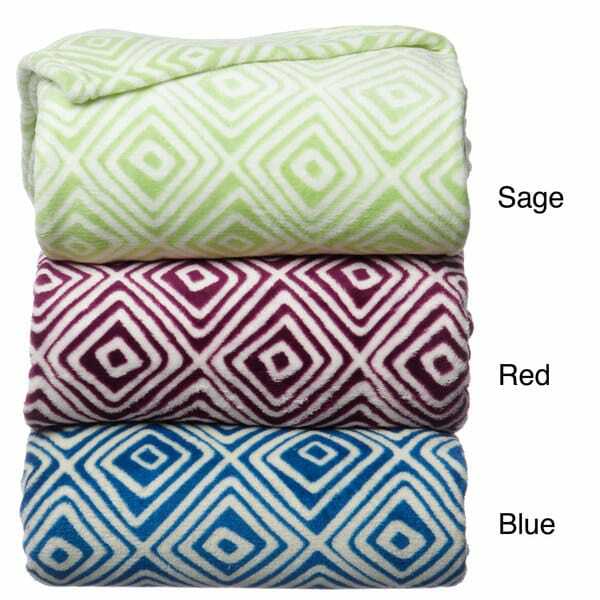 I ordered the sage blanket which FYI is more yellow/celery green than sage like pictured but was the exact color that I was looking for. Purchased the blue and the light green. I don't even like this green. But the pattern drives me crazy, love it. Good weight for warm weather or layering. Totally synthetic so the static is nuts. Wish the King were a little larger. Noticed online here that there are some others offered just the same but different patterns, must be same manufacturer. So if you want some very light but warm blankets, see them - not necessary to go this wild for your pattern. Nice, heavy blanket that is super cozy and warm. Fast shipping. The only drawback I can see is that the hem is not quite evenly sewn, but the pattern is so busy that it's hard to notice. I got the blue, but wish now I had gotten the yellow. All in all, a great item and a very good price. The blanket is soft, nicely heavy, and a good size. But the color is completely different than what I expected from the photo. I ordered the "sage" blanket which looks yellow with a hint of green in the photo, at least on my monitor. The blanket was bright lime green; there wasn't even a hint of yellow. I am returning it and ordering the blue one. I had to return the red blanket as the color did not match the photo or description. It was definitely more magenta than the dark red I was hoping for. Nevertheless, the blanket was definitely plush and comfortable. If you don't mind the color, the blanket is worth the money. The color of the blanket when it arrived was WAY off from the picture and description. It was supposed to be navy but in reality it is a very bright blue. WAY way too bright for what i thought i was purchasing. This balknet is very soft and snuggly. I haven't washed it yet, but it hasn't left any lint or fuzz on the couch or bed. I bought it as an extra blanket for our guest room and put it to use the day it arrived. Most blankets only come in a few pale, muted colors, so the pattern definitely appealed to me. I wish there were a few more colors to choose from! This blanket is perfect for a chilly night. It keeps you so warm you will be surprised. I ordered the yellow/lime green color and although it was brighter than pictured I like that about it. It's summer time! I plan on dry cleaning it to see if that helps, as I noticed a lot of complaints regarding shedding. This blanket is very warm and very soft. It gives off alot of lint prior to first wash but holds up well after the wash. The blue is not as navy as seen in the pic though. do NOT buy this blanket! It arrived and was beautiful and soft and warm. But 10 or so washes in, it's giving off so much lint and fluff that everything it touches is suddenly covered in clumps of a blue hazy fuzz. I can't even LEAN on it with clothes on lest they get attacked by the lint. I have to throw it away. I like the look and the feel of this blanket but after the first wash, it shedds like crazy! The blanket has been donated. It pilled so much I was constantly vacuuming little blue puffs of lint. I hoped washing would remedy it but it did not. Soft blanket. Has held up well. Have washed several times &amp; has held up great. So far, blanket is soft but is a bit small for sizing stated. If there's any way you can buy this blanket and hardly ever wash it, then buy it! It's as gorgeous as you'd hope, super soft, but sheds and pills TERRIBLY when it's washed. I'd have blue fuzzies all over my house, self and animals when it was on my bed. I ended up donating it to an animal shelter a few winters ago because I couldn't handle it any longer. Love these blankets. Bought 2 for twin beds. Everyone that sleeps here wants them. Very comfortable. The looks and it is on sale. I am hoping it is warm!!! I think that this product looks like a great item to pull out of the closet for a guest. It fits very well with my modern style couch. And, it seems comfy enough for those lazy mornings. I can't wait to try it out! "I am looking for a yellow blanket to fit a king size bed. The color that appears to be yellow is called sage. Can you tell me if it is green or yellow and if it indeed will cover a king bed?" Our monitor shows that it is a yellow blanket, but differences in computer monitors may occur to show different shades. The king size blanket is 108 inches wide x 90 inches long, and will fit a king bed.